For months, Western media has reported on the existence of “internment camps” in Xinjiang province, western China, which is home to about 10 million Uighurs — the Muslim ethnic minority group that makes up almost half of the total population of the province. In August, the UN also expressed deep concern about reports that China had forced as many as 1 million Uighurs into these camps. All the while, Chinese officials kept denying the camps’ existence, although they did acknowledge a program of “resettlement” for people referred to as extremists. Just like in neighboring Myanmar with its Muslim minority the Rohingya, China, due to a few acts of violence, seems to be taking excessive measures to crack down in Xinjiang in the name of protecting the peace and preventing terrorism. Two weeks ago, in an interview with the Xinhua News Agency, the chairman of the Government of Xinjiang Uyghur Autonomous Region, Shohrat Zakir, described at length the “vocational education and training program” being implemented, thus confirming the existence of the camps, which he stated aim “to get rid of the environment and soil that breeds terrorism and religious extremism and stop violent terrorist activities from happening.” He said the “training centers” provide for learning the country’s common language, legal knowledge and vocational skills, along with de-radicalization education. The interview came just before this week’s start of the Universal Periodic Review by the UN Human Rights Council of the track records of 14 countries, including China. Meanwhile, a report of the Office of the UN High Commissioner for Human Rights on China submitted to the council indicates that the Committee against Torture had received numerous reports from credible sources that documented in detail cases of torture, deaths in custody, arbitrary detention and disappearances of Tibetans, Uighurs and Mongolians. The report also pointed to the high rate of unemployment among persons belonging to these ethnic minorities, in part due to Han Chinese (China’s ethnic majority) migration into minority areas. It also raised concern that ethnic minorities continued to face severe restrictions in the realization of their right to take part in cultural life, including the right to use and teach minority languages, history and culture, and to practice their religion freely. 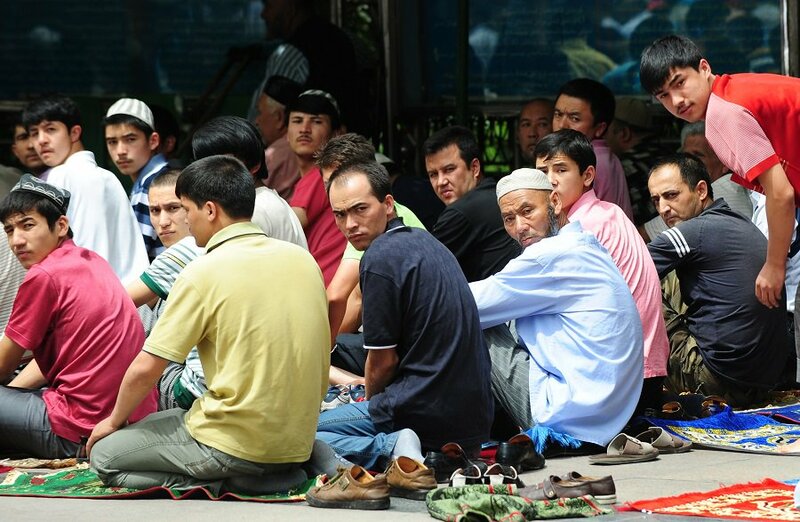 Media reports have claimed there is evidence of Chinese authorities tracking Uighurs’ cellphone activity and forcing their men to cut off their beards and women to remove the veil. There are also claims that China has demanded the Uighur diaspora hand over personal information — and threatened their families if they did not. The BBC reported that Chinese authorities in Xinjiang had revised a law designed to promote the use of detention centers “to carry out the educational transformation of those affected by extremism.” According to the new legislation, examples of behavior that could lead to detention include expanding the concept of halal to areas of life outside diet, refusing to watch state TV and listen to state radio, and preventing children from receiving state education. There have been acts of violence in Xinjiang in the past that were forcefully subdued. China accuses Islamist militants and separatists of orchestrating the trouble. However, the violence is a symptom of the problem, not the cause, which is economic and political inequality. By continuing with its repressive approach, rather than getting rid of the soil that nurtures terrorism, it is actually sowing the seeds. With its new policy relying on security measures and cultural assimilation, China is abandoning its own prior policies of multicultural and multi-confessional tolerance. The international community should urge China to uphold the provisions in its own constitution that provide for the cultural, linguistic and religious autonomy of its minority groups. However, it is not just about combating religious extremism. China is aggressively pursuing its efforts to revive the historic Silk Road through its One Belt, One Road program, in which the Xinjiang region plays an important role. Xinjiang is strategically located and is rich in natural resources. The region is witnessing ongoing developments, including the construction of high-rise buildings, a new “state-of-the-art” high-speed railway, industrial and economic zones, and new factories. The authorities have also introduced policies to lift rural residents out of poverty, while rebuilding Kashgar’s old town, which meant demolishing many parts of this historic Muslim area and relocating its residents. China is keen on having tight control over this region for its Belt and Road Initiative. With little access or communication with the people in the region, it is difficult to verify the media reports. Delegations from the Organization of Islamic Cooperation (OIC), which is concerned with the situation of Muslims around the world, especially minority groups, have visited Xinjiang a few times either as an official delegation or as part of an international media group. Another visit during these times, especially to see the training centers, would help clarify some points.